Continuing in an unofficial streak of "hey, there's another Abel Ferrara movie I haven't watched yet," I finished up Ms. 45 and noticed a copy of The Addiction on the "to see" pile. Ferrara made The Addiction between Body Snatchers and The Funeral (there's also Dangerous Games, the Harvey Keitel / Madonna movie that most of us didn't see in there as well), the former I have not seen and the latter I have. It was interesting to see Ferrara making another movie set in contemporary New York, especially following Ms. 45, which is a "New York at the cusp of the 80s" and King of New York, the equivalent for the 1990s. This is more of the New York wedged between the end of the grunge era and the beginning of the Wu Tang dynasty. 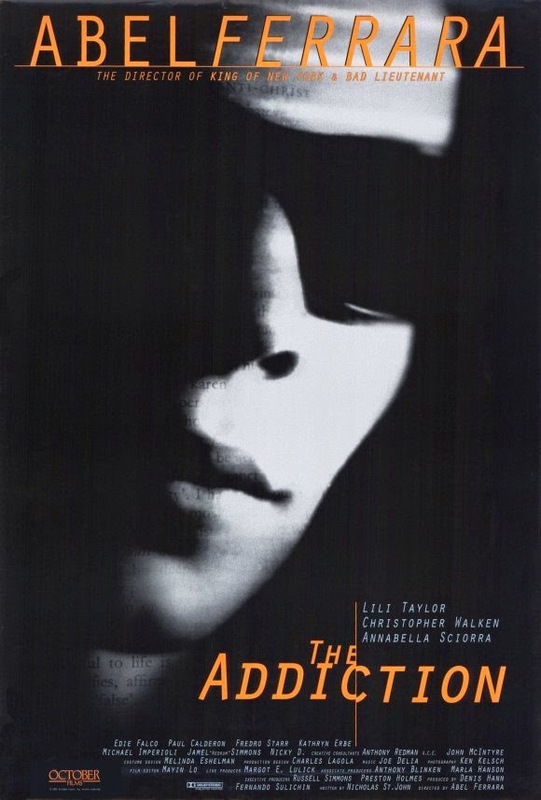 At least, that would have been the case if The Addiction came out in 1994 (the trademark on the credits) and not 1995 (released alongside The Funeral); Maybe Ferrara wanted to draw a sharper contrast to Wes Craven's Vampire in Brooklyn.